We arrived in the UK from New Zealand 20 years ago, looking for adventures abroad, only to find that the first house we bought here was wrecked by cowboy builders. We were devastated, and our life savings were drained. Determined to succeed because we loved the transformational process, we learnt from this and have since continued to buy, renovate and sell many other properties. Recently, we decided to change careers from IT consulting in the City to focus on property. We also wanted to help others by sharing our knowledge, so we decided to write a book about our experiences in the property market. Writing ‘The Property Handbook’ can only be termed a labour of love for us because of the time and effort that has gone into creating it. We have invested almost a year in this pursuit, and it has been a year very well spent. We started writing in January 2018 by creating a Table of Contents, and an outline of the chapters, so that we knew the overall structure for our book. This also helped us to decide which one of us would write each chapter. We thoroughly enjoyed the creative process as we went through writing, researching, collating, designing and presenting information. Reviewing and editing each other’s chapters took considerable time as we skipped between buying, renovating, interior design & decorating, staging, selling and moving home. We created our book jacket and logo while also being involved in the development of our website and social media channels to promote our book and services. Alongside this, we completed two Diplomas, one of which is in Interior Design and Decorating. We are featured on Houzz and are Founding Members of Home Staging Association (HSAUK). Paloma Harrington-Griffin, Director of HSAUK, has edited and provided valuable input for the Interior Design & Decorating and Staging chapters of our book. We have really enjoyed working together and completing this project. Seeing our book on Amazon for pre-order from November 2018 has been immensely satisfying. There is great joy in producing something so individual. If you are thinking of writing a book, start it now. And as you begin, know that this labour of love can take on a life of its own and just like Bilbo Baggins, there’s no knowing where you might be swept off to! 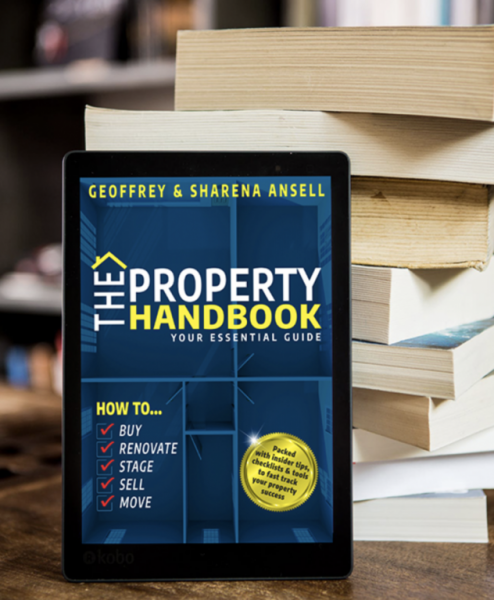 Buy Sharena & Geoffrey’s Property Handbook for the best tips on renovating, staging and selling, or simply learn more about Sharena and Geoff by visiting their website.